The core GNSS market includes only the parts of products’ retail value that are directly attributable to GNSS (for example, only one percent of the retail price in the case of GNSS-enabled smartphones). 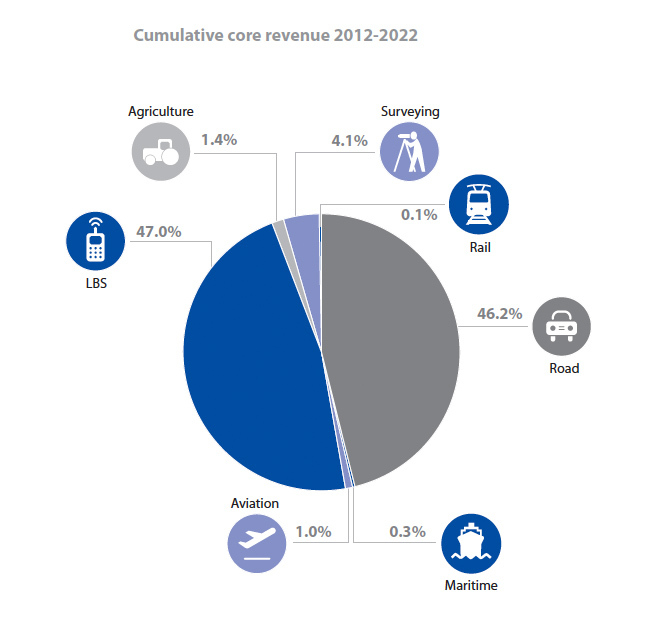 It also includes service revenues directly attributable to GNSS. The GNSS-enabled market includes the core GNSS market plus the full retail value of all GNSS-enabled platforms. The latest GSA study places this larger market valuation at about €230 billion in 2020, actually declining about €10 billion from a peak in 2018. The first GSA market report published in 2010 had predicted continuing growth in the GNSS-enabled market through 2020, reaching a worldwide total of €244 billion. 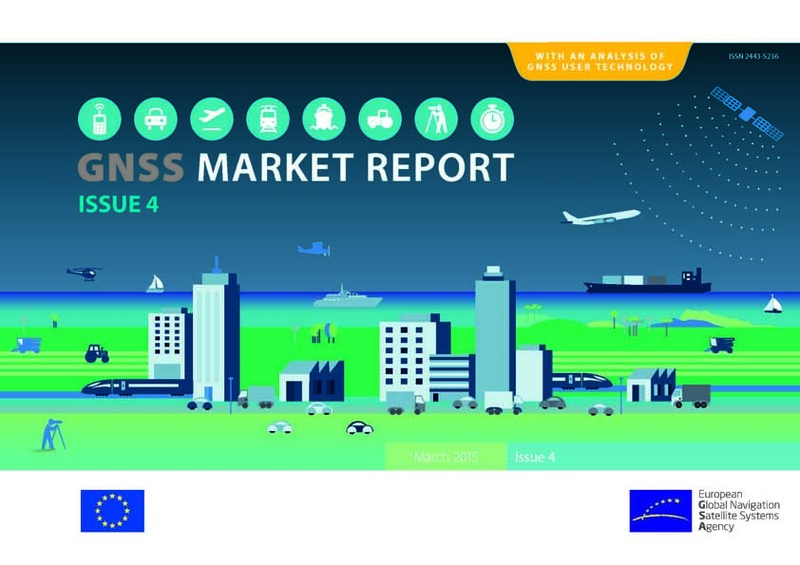 In its GNSS Market Report Issue 2, analyses of maritime and survey application markets join those of road, location-based services (LBS), aviation, and agriculture also covered in the first GSA market study. The addition of the surveying and maritime market segment in new report changes its projections of the share of the cumulative 2010–2020 global core GNSS market predicted for the six application areas. The road market segment continues to be the largest at 54 percent (56.4 percent in 2010 study), followed by LBS at 43.7 percent (2010 report: 42.8 percent). By 2020, annual worldwide shipments of GNSS device in the road sector are projected to reach nearly 440 million units, up from about 180 million units this year. Market share will move steadily from Europe and North America to the rest of the world. Road applications go beyond simple navigation to include such large-scale services as the European “eCall” initiative, similar to the E911 emergency location service for mobile users in the United States, and electronic toll collection systems. Unlike E911, however, eCall is vehicle-based and designed to bring rapid assistance to motorists in a collision in the EU by dialling 112 automatically. In recent years, public and private sector adoption of eCall has accelerated will all new type-approved models of passenger cars and light vehicles in European Uniton exspect to incorporate on-board eCall systems from 2015 on. According to the GSA study, the remaining segments will represent small shares in the core GNSS market: agriculture, 1 percent; surveying, 0.6 percent; aviation, 0.5 percent; and maritime, 0.1 percent. 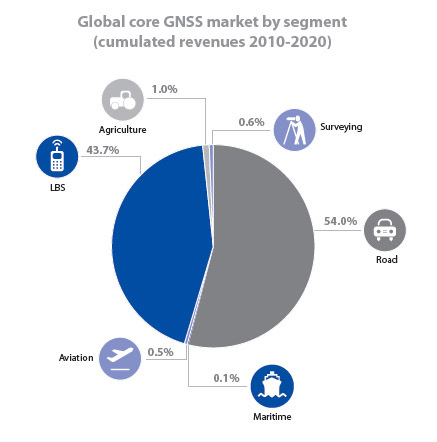 Despite its relatively small market share, surveying-related GNSS sales are expected to expand rapidly over the next eight years. 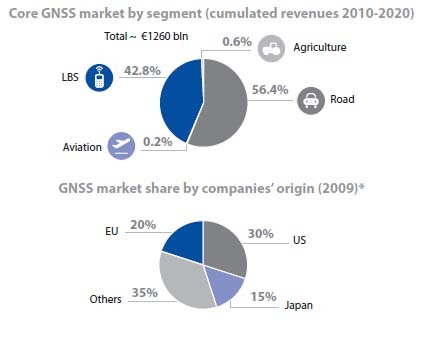 In 2010, the GNSS market in surveying represented about €1.4 billion (US$1.73 billion) for 120,000 units sold worldwide. By 2020, this market will represent around €4 billion (US$4.94 billion) for 500,000 units sold worldwide. This growth will be driven primarily by the rise of construction applications, especially in North America. The construction sector alone represents about 60 percent of the total worldwide survey sales in 2011 and is expected to represent near 85 percent of the market in 2020. In the maritime sector, search and rescue applications will drive a 6 percent CAGR through 2020 in that application market overall, although GNSS-related systems used for general navigation will represent the largest value in this market. Revenues from GNSS in the merchant maritime domain will reach €169 million (US$209) per year by 2022. The new report was produced applying the GSA’s market monitoring and forecasting process, based on “advanced econometric techniques.” An extensive set of variables is used to model scenarios based on key assumptions. These assumptions are cross-checked through an iterative process involving renowned experts in each market segment. Additionally, a check is performed for each segment by comparing the model’s results with the most recent market research reports from independent sources. The model makes use of publicly available information including the following sources: Eurostat, US National Transportation Statistics, International Road Assessment Programme (iRAP), United Nations public information, International Telecommunication Union (ITU), Nations Online, GSM Association, Boeing, Airbus, Federal Aviation Administration, General Aviation Manufacturers Association (GAMA), Eurocontrol , the Food and Agriculture Organization (FAO), FP7 project websites. The surveying chapter has been prepared in cooperation with the Council of European Geodetic Surveyors (CLGE). The 2012 GSA Market Monitoring Report can be downloaded free here.